On the day of your test, drink at least a quart of any liquid to dilute your urine. If possible, take 50 mg of vitamin B complex to color your urine. For the test, add one vial of Klear to each urine sample and swirl the sample to completely dissolve. 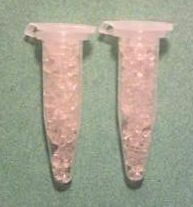 For samples larger than four ounces use two vials of Klear. Do not take internally. Avoid contact with skin and mucous membranes.